The hatchery is where it all begins for our fish. We are continually improving our practices to care for them from the moment the eggs are hand-milked from the brood fish, right through to their transfer to sea. The conditions in the hatchery are designed to mirror the natural life-cycle of salmon, as well as allowing us to naturally synchronise growth in a way that means we can get fresh, healthy fish to your plate all year round. Growth is synchronised by using lights to mimic longer daylight hours, and varying the temperature of the water that we hold the eggs and small fish in, while changes in day length prepare the fish for their transfer to sea. You can read more about each of our hatchery sites below. Our Bridport Hatchery is at the mouth of the Brid River in the State’s north east. The hatchery was originally established in 1964, and was home to Tasmania’s first commercial trout farm. Today, the hatchery operates as a flow-through aquaculture facility, with water drawn from the Brid River before being returned to the Estuary. The hatchery has its own incubation unit, a small recirculation facility for start feeding, twelve fry tanks, three large tanks plus smaller tanks and two concrete raceways. Here trout are raised to 400g before transfer to Macquarie Harbour, and salmon smolt are raised to 200g. Unlike some of our other hatcheries, the Bridport facility does not hold brood stock for egg production so fertilised eggs are brought in from our nearby Springfield hatchery. At Bridport they hatch, and are grown to size ready to be transferred to sea. Given the hatchery’s long history of operation, we have recently undertaken a series of upgrades to improve existing site infrastructure and staff amenities. Upgrades include replacing the water-intake pipeline, stabilisation and repair of the original water race, improving filtration, disinfection of the incubation and start feeding recirculation facilities, and drought mitigation. Our Millybrook Hatchery is in a remote location near the head waters of the South Esk River, in the Esk River valley near Mathinna, an hour and a half from Launceston. The site was established as a traditional flow-through facility, with water drawn directly from the South Esk River. The water flows through six grow-out tanks and eight earth raceways before entering a large landscaped settlement pond before being returned into the river. Established flora and fauna in the settlement ponds effectively remove particulates and nutrients in the water before it leaves the farm. To mitigate against drought conditions during summer, a recirculation system has been installed to ensure a continuous water supply. We regularly conduct water quality sampling, and Millybrook has an ‘A Rating’ for downstream invertebrate communities, which means that there is no change to the river’s macroinvertebrate ecology before or after the hatchery. Millybrook receives juvenile salmon and trout from our nearby Springfield hatchery for on growing. The salmon are grown to 200g and the trout to 500g at which stage they are transferred to sea. Our Springfield Hatchery is located approximately 20 kilometres from Scottsdale on the banks of the Myrtle Grove Creek. The hatchery is one of the oldest in the state and once produced salmon and trout eggs for export around the world. 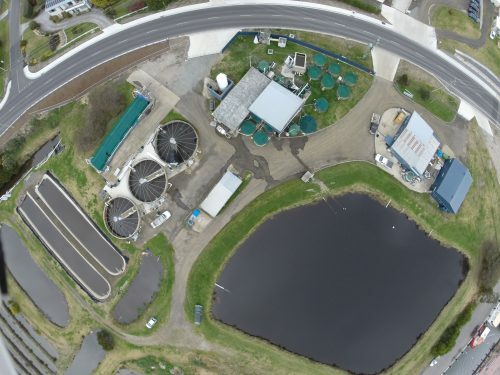 The site is a combination of outdoor flow through ponds which house brood stock and six grow out tanks for smolt production, plus a recirculation, incubation and start feeding facility for the fry and a recirculation facility for brood stock. The brood stock in the ponds are mainly for caviar production whereas the brood stock in the recirculation facility provide approximately 60% of the company’s commercial production from selectively bred brood stock. The recirculation facilities allow us to maintain the optimal conditions for best quality and performance to ensure brood stock are kept in peak condition. Unlike our other flow through facilities, Springfield has the benefit of having two water supplies. The first is a spring-fed supply from the Myrtle Grove Creek and the other irrigation flow from the Headquarters Road dam on it’s way to the Forester river. The dam was completed a few years ago and has ensured water is always available during dry summers. 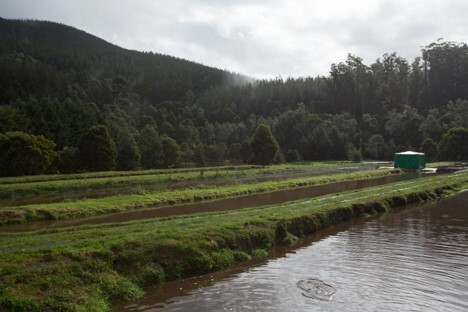 The outflow from the flow through facilities passes through a long vegetated settlement dam to remove nutrient before entering the Forester river. The outflow from the recirculation units is used by a neighbouring dairy farmer for irrigation and fertiliser. The Lonnavale Hatchery is located on the banks of the Russel River, 30 minutes from Huonville. The site is a diversity hotspot with Huon staff seeing quolls, wallabies, snakes and platypus on a near daily basis. The Hatchery holds a few brood stock in seven ponds and four tanks in the flow through facility, and incubates eggs and grows the stock through to smolt transfer in a self-contained recirculation unit. To ensure there is no irrigation run off during the wetter cooler months, the water is stored in dams. In the drier summer months, this water is used to drip-irrigate plantation forest on the surrounding property, Maiden Meadows. Irrigation is controlled by soil moisture sensors and irrigation is conducted according to the Environmental Protection Agency approved Wastewater Reuse Environmental Management Plan. The flow through tanks are fitted with drum screens to remove any waste and the water then flows through two settlement ponds and an extended riffle section (shallow gravelly streambed) before it enters the river. The hatchery operates under a strict Environmental Protection Notice with very low emission limits that are monitored by regular sampling. Forest Home Hatchery is our newest hatchery located at Judbury near Huonville. It was opened in November 2016 and recirculates 95-98% of its water back through the hatchery on a daily basis. Forest Home receives eggs that are introduced to the site from Lonnavale, Springfield and the SALTAS hatcheries. At Forest Home they are then hatched and grown on to 150-250g before they are put to sea. Fry – the small fish are introduced to these 12 tanks for start feeding and are grown up to 10g before being moved to the parr tanks. 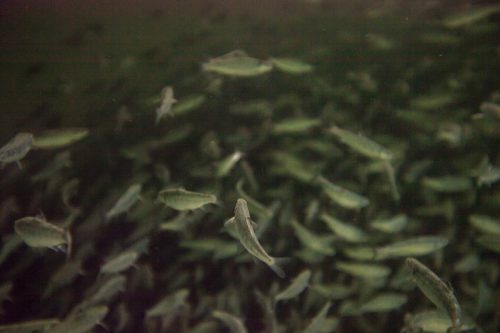 Parr – the 10g fry are grown in these 12 parr tanks until they are approximately 60g when they are then moved to the smolt tanks. Smolt – the 60g parr are grown on in the 12 smolt tanks to 150-250g. As with Lonnavale, to optimise welfare and performance, the tank environment is carefully and constantly managed with regard to light, flow, PH, Dissolved Oxygen, Carbon Dioxide, alkalinity, temperature and nutrients. Additionally, feed is carefully controlled to minimise potential wastage. As part of the recirculation process, all waste from the fish is collected and separated into solid and liquid fractions. The solids are transported off site for use as in compost and fertiliser on nearby farm land. Wastewater is filtered to remove fine solids and is then passed through ozone treatment for disinfection. Once disinfected, it passes into two settlement and storage dams and is irrigated onto adjacent farm land in the drier summer months. The facility operates at Class A wastewater treatment standards (with all wastewater disinfected) and staff regularly see platypi and wild fowl in the settlement and irrigation dams. 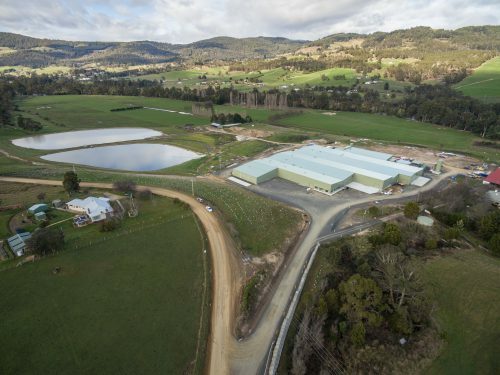 The SALTAS Hatchery is located in the upper Derwent Valley at Wayatinah and Florentine. 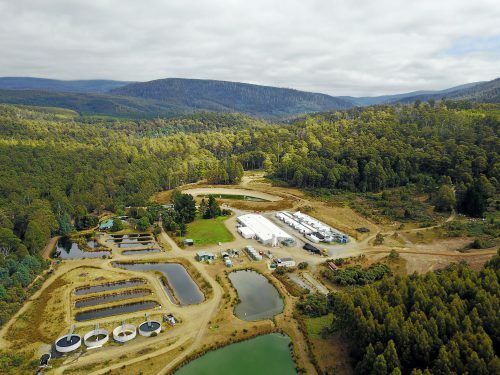 This is an industry owned and run hatchery where Huon collaborates with other Tasmanian salmon growers in running the industry selective breeding program. 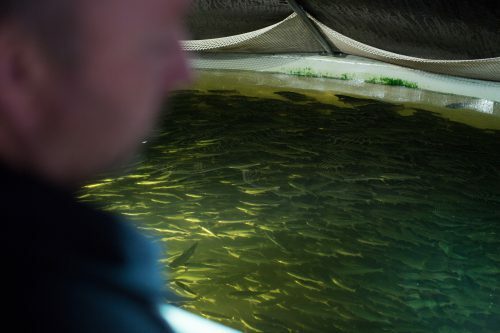 The program has run since 2004, and sees fish carefully selected and bred in a way that both ensures the genetic strength of the stock and improvement in key performance traits. Key traits include increased amoeba resistance, growth and improved fish quality. We receive brood stock from this facility to use in our other hatcheries. The Meadowbank Hatchery is located on the banks of the River Derwent below Meadowbank dam in the middle Derwent Valley. The site is a traditional flow through facility, with water drawn directly from the River Derwent flowing through the fourteen grow out tanks. The outflow immediately passes through drum screens that removes nutrients and waste feed which is used by a neighbouring farmer as fertiliser. The remaining water enters large settlement dams and then into a mature extensive wetland system that absorbs most nutrient before it is eventually returned to the river. This site on grows fry it receives from the other Huon hatcheries, primarily Forest Home and Lonnavale. When smolt are ready to go to sea, they are transported from our hatcheries in specially designed tankers. Fish destined for leases in the state’s South are taken to Port Huon where they are transferred onto our well-boat the Ronja Huon. Those destined for Macquarie Harbour are transferred onto our landing barge the Captain Bill and piped directly into the pens.